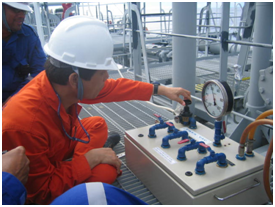 The objective of the Pumpman course is to provide personnel with the theoretical and practical knowledge and the skills necessary to operate, maintain, and repair the equipment associated with the handling of liquid cargo. The absolute requirement of a pump man to work on oil rigs has been proved time and again because pump man helps to maintain a steady and smooth functioning of the entire pipelines fitted in an oil rig or oil tankers. The pump man’s job is something that requires continuous vigilance and alertness because he is the main person in-charge of the pipelines of an oil rig and oil tanker vessels like VLCC. His job is to ensure that all the cargo oil or drilled oil flows smoothly into the required pipes and is collected as required. If there is any problem of sludge (dirt and waste materials) accumulating in any of the numerous pipelines then the pump man has to make sure that all such waste material is duly cleaned so that no problem or hitch in the oil drilling or oil transferring process occurs. He is also responsible for repairing of damaged pipelines before any accident stands to occur. Engine room ratings, fitters, Offshore oil rig mechanics who want to upgrade to pumpman.